Puget Sound chinook salmon are listed as a “threatened” species. Southern Resident killer whales eat primarily chinook salmon. Therefore … isn’t it obvious that the shortage of Puget Sound chinook has had a major impact on the whales? Once you begin to challenge the assumptions — as a seven-member scientific panel has done — a more complex picture emerges. It is not easy to sort out predator-prey interactions, especially considering that the prey may include hundreds of individual salmon stocks, some of which are doing quite well. The independent panel (PDF 144 kb), made up of U.S. and Canadian scientists, tackled the question of whether cutbacks or elimination of salmon fishing could help rebuild the killer whale population at a faster rate. The panel’s preliminary conclusion is that reducing fisheries could have a slight benefit, but only if certain assumptions hold true. An axiom among orca observers goes something like this: When you believe you have figured out what killer whales will do, they’ll do something else. I’ve become accustomed to writing an annual story that lets people know when chinook salmon runs are dwindling in the northern waters of Puget Sound and the Strait of Georgia and when chum salmon runs are beginning to build up in South Puget Sound. It happens in the fall, and it generally means that our Southern Resident orcas will begin checking out the buffet table in areas from Whidbey Island to Tacoma and occasionally as far south as Olympia. During this time, ferryboat riders aboard the Kingston, Bainbridge Island, Bremerton and Vashon Island ferries begin seeing the whales more frequently. It appears that the table is now set and waiting for the whales, but that doesn’t mean they’ll show up for dinner on time, as I describe in a story I wrote for yesterday’s Kitsap Sun. Lots of people reported seeing the orcas last week, when they were spotted from all the usual ferries, including some rare sightings on the Mukilteo run. The video on this page was taken at Point Robinson on Vashon Island and shows how exciting it can be to watch whales from the shore. While the Southern Residents are known to eat chum in the fall, there is no doubt that their preferred prey is chinook salmon, which are listed as threatened under the Endangered Species Act. How to make sure the orcas are getting enough chinook to eat is part of a major study effort now under way, including a series of workshops about the effects of salmon fishing on the killer whales. A report of the first workshop, held Sept. 21-23, contains an incredible amount of scientific information related food availability and the value of different salmon to our local orcas. 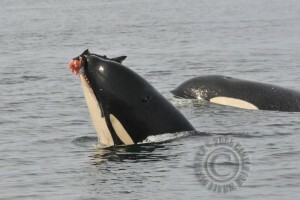 Check out this page: Evaluating the Effects of Salmon Fisheries on Southern Resident Killer Whales.